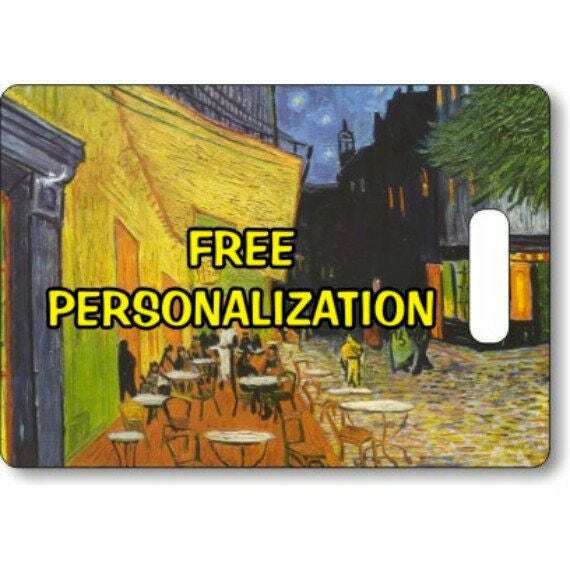 A personalized double sided high resolution image of Vincent Van Gogh's painting called Café Terrace at Night on a rectangular luggage tote bag tag. The painting is also called The Cafe Terrace on the Place du Forum. It was painted in 1888 and depicts a coffee house in Arles, France. This unique rectangular 2-sided luggage/bag tag with precut slot measures 2.75" x 4" x 3/32” thick. It is made of Fiberglass Reinforced Plastic with UV resistant top coat which is easy to clean with a damp cloth. The finish is glossy. Personalization: Please put the text you would like on the bag tag in the comments section when paying. If there is no text in the comments section we will contact you immediately and request the text. You may also send us a message with the personalization text if you prefer. We must receive the personalization text within 24 hours of payment as we ship within one business day of payment. We will ONLY put text on the red and white striped area of the flag design. There is a maximum space for personalization of 5 lines with 10 characters/spaces per line (more on the space under the square of stars) on each side of the tag.